Let’s forget about the fact that James Cameron’s Aliens is the sequel to Ridley Scott’s Alien, for the time being at least. Instead, we should take a moment to appreciate this example of the sacred union of action and sci-fi. You see, both genres fly in the face of regular realism requirements and, when married, provide more thrills than you can shake a stick at. For those of you who haven’t seen it, Sigourney Weaver returns as Ellen Ripley, survivor of the alien attack which destroyed her craft and obliterated her crew in Alien. Found in statis (that’s artificial sleep in sci-fi talk) 57 years after her traumatic ordeal, Ripley discovers that planet LV-426 (where the original alien boarded her craft) has been colonised by humans, who have lost contact with Earth, predictably. Cue a squadron of cocky Colonial Marines, a shipload of weapons and one excruciatingly irritating company executive to supervise. As you can imagine, they don’t arrive to a tea party and Ripley soon has to replace the inept Lt. Gorman (William Hope) as legions of aliens emerge to defend their nest. Cue grisly deaths, a crashed ship and a nuclear reactor counting down to self-destruct. I think it’s time to approach the whole sequel thing now. It’s sort of the elephant in the room with Aliens. The whole time we’re thinking, ‘Hmm, it’s not like Alien at all really is it?’ As anyone will tell you: Alien is a horror film, Aliens an action movie. But then, that’s the point. It’s not a horror film once you know what’s chasing them, and that it can be killed. So instead Cameron offers us a hoard of terrifying aliens in what quickly escalates into an all out war movie. There’s still the terror lurking in the darkness, it’s all just more bang than boo. The emphases on tone might have shifted, but the underlying ideas are all the same. 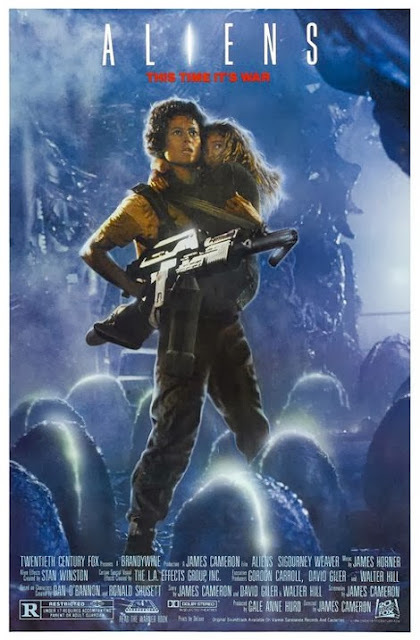 Ripley is on the war path once she finds a young girl hiding in the ruins of the colony (Carrie Henn): it’s a battle between matriarchies from there on out. But I won’t go into the details of the feminist undertones (and apologies to Jo and Rachel whom I scarred with a graphic explication after Prometheus). He might stay true to Scott’s initial themes, but Cameron also adds his own postcolonial bent. Remember the idiot entrepreneur in Avatar? We have his counterpart in Carter Burke (Paul Reiser), the capitalist who fatally underestimates the situation in trying to make a buck. It’s all evil imperialism getting its comeuppance. Add onto this the resemblance of the Colonial Marines to the U.S. army in Vietnam and you’ve got a typical Cameron gift-wrapped-for-the-masses political statement. Damn hippie. You might be shocked to hear me say it, but films don’t have to be intellectual to be interesting. Whilst Aliens isn’t a dumb movie, it’s not primarily concerned with making ‘deep’ points either. It gets on with delivering an action-packed blockbuster while (by the way) nodding towards themes from its predecessor and indeed adding a couple of its own. The result? Entertaining, if not comfortable, cinema which isn’t dim-witted. Wonderful.